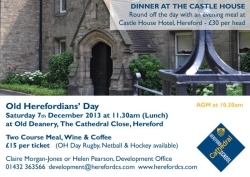 This year OH day will be bigger and better with the additio of Chess to the programme to complement Netball, Rugby, Hockey, Lunch and Dinner at the Castle House Hotel. A full programme can be found in the events section. Tickets for lunch and dinner are £15 and £30 respectively and partners are most welcome. 7.30 pm	Informal Buffet at Castle House Hotel, Castle Street, Hereford £30.00 per person	This is an informal get together for you and your partner to enjoy.